The folklore ensemble of nine musicians and singers was founded in 2009 by folklore songs arranger and radio presenter Miroslav Šimandl. The ensemble itself is formed by young musicians, students and alumni of Pilsner conservatory. Most of them began their musical career at children’s folklore ensembles. 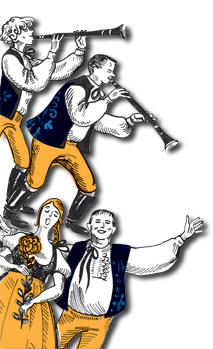 Pilsner MLS is based on the legacy of the štrajchová (wind and string instruments combined) and dudácká (bagpipe) music of the western and southern Bohemia regions (mainly Plzeňsko, Žinkovsko, Chodsko). The ensemble gathers a wide range of musical instruments including three violins, two clarinets, a contrabass, a bagpipe and a hurdy-gurdy (a medieval string instrument). The ensemble offers a varied programme with folk songs, compositions and accompanying commentary, suitable ideally for local celebrations, historical events and anniversaries, as well as for solo concerts. Pilsner MLS has released his first CD!